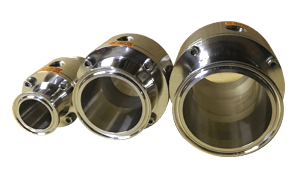 The Nex Flow™ Ring-Vac™ Pneumatic Conveying System with Sanitary Flanges are made especially for food, pharmaceutical, and other sanitary applications. All units are made from 316L stainless in sizes of 1″ to 3″. Many applications in a sanitary environment require transport of materials over long distances. 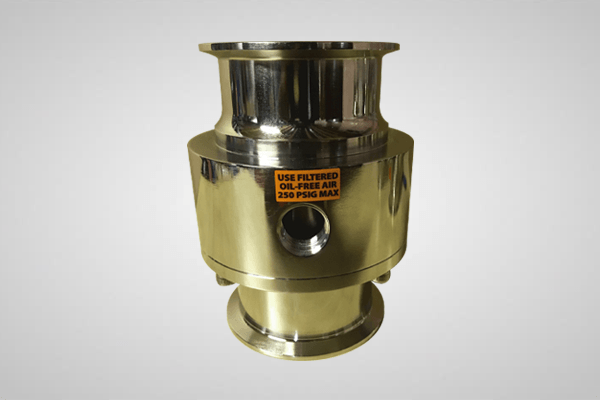 The Ring-Vac™ with Sanitary Flanges have been designed for these special and demanding applications. All Ring-Vac™ products are compact,lightweight, easy to install, and portable. The compressed air supply in sanitary environments must be properly filtered to keep the compressed air clean and dry. Special filtration products are available from other supplies for this purpose if necessary. A regulator installed upstream from the unit will control the pressure supplied to the Ring-Vac™ and allow for the variation in flow rate and velocity. Material to be conveyed must be able to have some air movement around the material to draw it into the Ring-Vac™ system. It has to “breathe” so that the air passes around the material to be conveyed in order for it to be picked up. Another option is to drill holes or slots into the piping (smaller than the material conveyed) to create a suction to help pick up the material. If the material is too packed together, it may need to be loosened before it can be properly picked up to be conveyed. Ring-Vac™ compressed air conveying system – Compressed air enters at point (A) into a annular plenum chamber and injected into the throat of the unit though directed nozzles. These jets of compressed air create a vacuum at the inlet (C) which draws in material and accelerates it through the unit and out at (D) conveying the material over a great vertical or horizontal distance.